📅 July 2018 February 19, 2019 by Bruno B. Deciding which are the best islands to visit in Azores? Confused about which ones to go and how to get around? Let me give you a hand and save you some precious time planning with my tips and itineraries I’ve crafted. Any local would say all the islands in Azores are beautiful, each in its own way. That’s not a lie, the highlights and landscapes across each island are vastly different. However, from a visitor point of view, some of them are indeed more interesting than others. No shade. Just being honest here. This article will give you an overview of what each island is Azores is all about so you can decide which ones to visit. I’ve also included sample first-time itineraries with several different durations: 7, 10, 14 and 21-day trips.No need to read extensive guides or spend days of planning. First tip: Avoid FOMO settling in. First of all, a quick intro. The Azores are a Portuguese group of 9 islands in the North Atlantic Ocean. They’re mostly known for its raw natural scenery and untouched landscapes of lakes, waterfalls, and green meadows. The islands are an eco-tourism paradise who just very recently have been “discovered” by mass tourism. 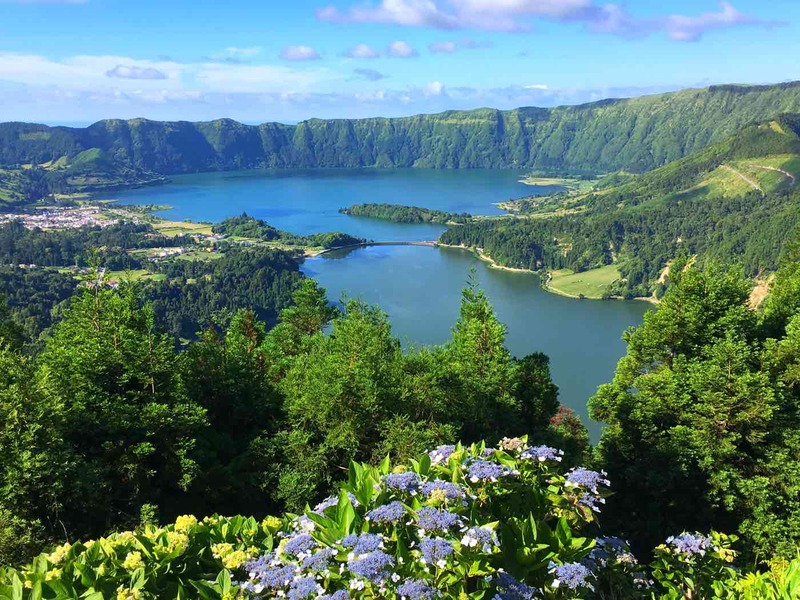 You can get to Azores flying directly from mainland Portugal, United States, Canada, or a few other European countries like Germany, Sweden or the UK. If it’s your first time visiting, I strongly recommend reading my intro guide to Azores with the main things you should know before your trip. One of them is that getting around the islands can be costly and time-consuming. It’s essential to plan efficiently and avoid FOMO (fear of missing out). If you’re always on the go rushing from point A to point B, it won’t be nearly as rewarding, trust me. Part of the true Azores experience is being able to chill and have time to take it all in. What is the best island to visit in the Azores? 9 islands of Azores have an incredible range of stunning landscapes, so I highly recommend you visit at least 2-3 of them to have a good grasp of life in the islands. That said, if your time is limited and/or don’t want to spend too much time in logistics, pick São Miguel island. Apart from being the easiest to fly to, it offers the largest amount of things to do and see. Island size doesn’t matter when it comes to delivering stunning landscapes. Let’s start… small. With a population of only about 420 , Corvo is the tiniest island in Azores. The entire island is an extinct volcano and the product of its past eruption(s). Fun fact: only in 1973 (!) the inhabitants got electricity! But don’t let its size fool you. This remote and peaceful island is a UNESCO Biosphere Reserve with protected waters, making it a place of excellence for snorkeling and diving. It’s also a great option for birdwatching, but to be fair, most visitors are attracted simply by the novelty of exploring such a remote and tiny island. ⭐ Top Attraction: Caldeirão. The crater of the extinct Corvo‘s old volcano. If weather collaborates, sunset here is incredible. ✈️ Getting there by plane: There is a small airfield in Corvo with flights to Faial and Flores. ️ Getting there by boat: An Atlântico Line ferry to Flores runs daily in summer months (but only twice/week in winter). Takes about 45 minutes. Book your tickets ahead.  Where to stay: Pirates Nest (how cool is this name?). ️ 3 activities to try: Birdwatching, diving, hiking. 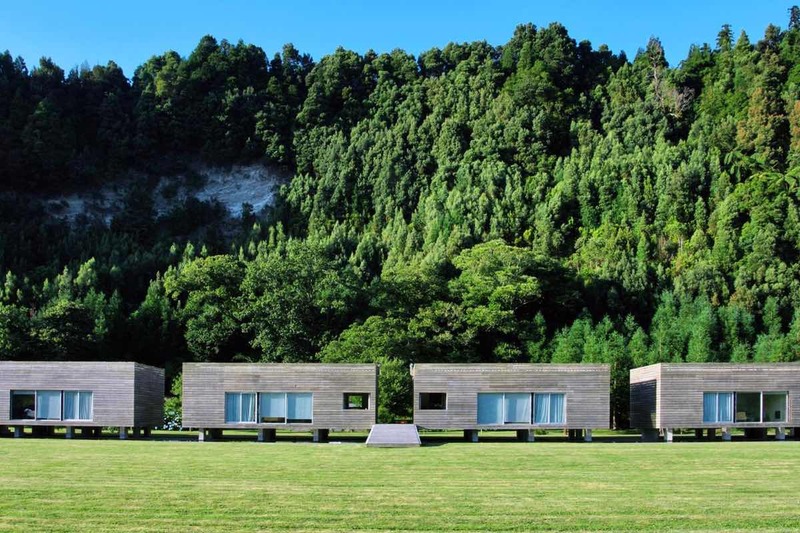  Go here if…: you want to experience what true remoteness feels like. Green is greener in Flores. The westernmost territory in Europe, Flores is well off the beaten track and not a common destination for first-time visitors to Azores. It’s raw, exotic and remote and a top-notch paradise for birdwatchers. In fact, the entire island is a UNESCO Biosphere Reserve, with dozens of waterfalls, lakes, and massive rock formations. Flores is the place where your adventurous side takes over, powered by the dramatic landscapes, lush hills and the charming roads embellished by vibrant hydrangeas. ⭐ Top Attraction: Poço da Alagoinha. Many large waterfalls in an area with lush green mountains and rock formations, this one of the most breahtaking natural sceneries in the Azores. ✈️ Getting there by plane: There is a small airfield in Corvo with flights to other islands. It’s a 1h30 flight to Ponta Delgada. 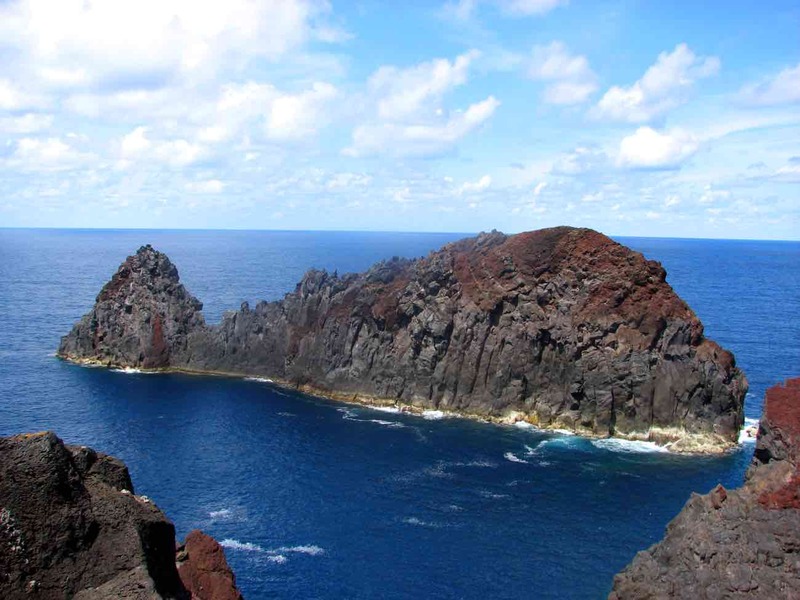 ️ Getting there by boat: Flores is connected to Corvo (all-year round) and to Faial (summer months) via Atlântico Line ferry.  Where to stay: Sítio da Assumada. ️ 3 activities to try: Birdwatching, canyoning, hiking.  Go here if…: you like nature at its rawest form. With the second-largest population after São Miguel, and known as the party island of the Azores, there is always something happening to keep you busy in Terceira. The highlight happens in June, where the massive street party of Sanjoaninas takes over the downtown of Angra do Heroísmo. Terceira is much more than partying though. 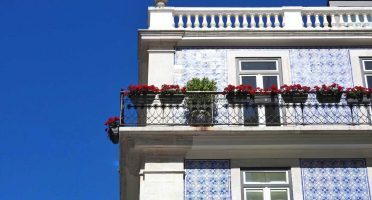 Make your way inland and you’ll find colorful architecture examples – look for impérios -, relaxing real-life desktop screensavers of meadows and forests, scenic lookouts like the pasture patchwork in Serra do Cume, and the volcanic chimney of Algar do Carvão. Or perhaps take a dive underwater to explore the dozens of centuries-old shipwrecks that can be found around the island. Also make sure you indulge in its famous food delicacies, a subset of Azorean food where the king dish is alcatra. ⭐ Top Attraction: Angra do Heroísmo. The pretty port city with colorful buildings is a UNESCO World Heritage Site. ✈️ Getting there by plane: Angra is decently connected to almost all the islands in the Azores, as well as the mainland Portugal (Lisbon and Porto). Azores Airlines also operates direct flights to the US. 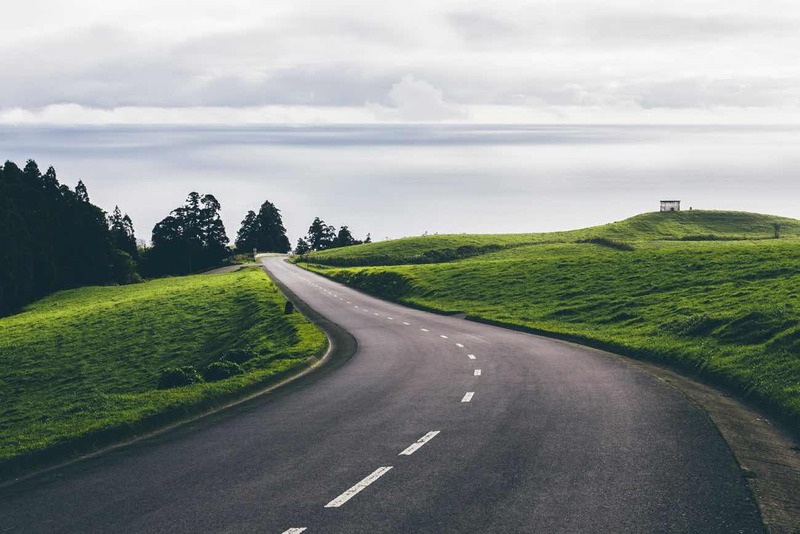 ️ Getting there by boat: During summer months, Terceira is connected directly to Graciosa, São Jorge and São Miguel via Atlântico Line ferry.  Where to stay: Terceira Mar Hotel.  3 activities to try: Diving, speleology, paragliding.  Go here if…: you’re looking to add a killer food&party break to your vacation. How cute is this whale-shaped rock? Remember when I said in the beginning that not all islands in the Azores are equally as interesting for a first-time visitor? Unless you have a whole month to go around the islands, I’m afraid Graciosa would have to be your first one to go. The island is roughly the same size as Manhattan and oh boy, could they be any more different! For starters, it’s a UNESCO Biosphere Reserve and exudes authenticity – food, people, culture, ways of living – and the fact it’s not changing anytime soon is reassuring. The kind of place where farmers still get around by donkey on their daily commute to their pastures. Don’t get me wrong – there’s a special charm about such an off the beaten track like Graciosa. It’s just if we measure what to see and do vs the effort to get there, it would be a smart choice to pick other Azorean islands first. ⭐ Top Attraction: Carapacho. Waters in this modern thermal spa reach 40°C allowing for a therapeutic and 100% natural thalassotherapy experience. ✈️ Getting there by plane: Graciosa is connected to Terceira island. ️ Getting there by boat: During summer months, Graciosa has direct Atlântico Line ferries from both Terceira and São Jorge.  Where to stay: Casa da Beira Mar. ️ 3 activities to try: Diving, fishing, speleology.  Go here if…: you want to escape the crowds and experience te full authentic Azores. The kind of view that gives you chills. 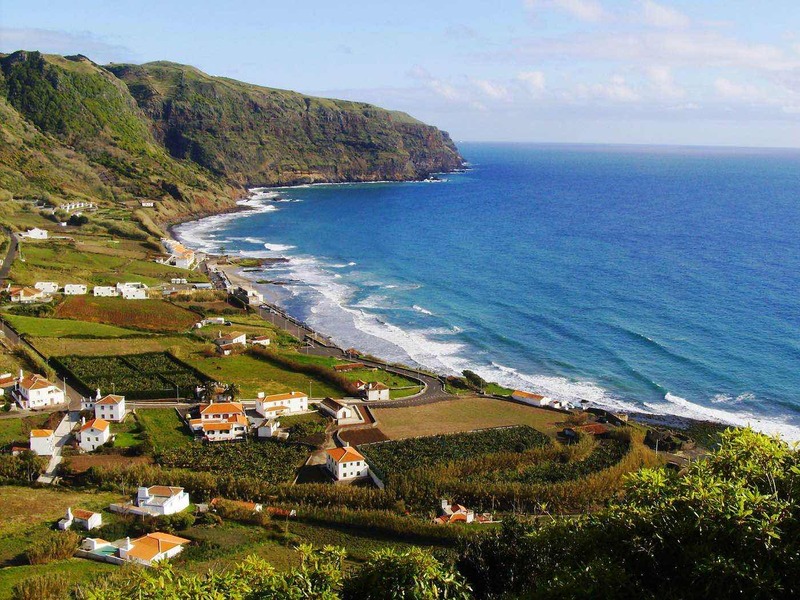 São Jorge is a tiny island – with only 8km width! – but encapsulates an incredibly diverse cocktail of captivating sceneries. From cliffs and ravines to lakes and surfing spots, its main feature is the almost vertical coastline interrupted by small plains formed by lava flows called fajãs. Apart from this rough landscape which potentiates all sorts of adventurous activities, it’s also known for its pastures, the birthplace of the famous unpasteurized cheese – Queijo de São Jorge. Don’t leave the Azores without trying it, it will ROCK YOUR WORLD. ⭐ Top Attraction: Fajã da Caldeira de Santo Cristo. Apart from the majestic scenario, the waves here are considered one of the best for surfing and body boarding in Europe. ✈️ Getting there by plane: SATA Air Açores has direct flights to São Jorge from Terceira and São Miguel airports. ️ Getting there by boat: Decently connected to Faial and Pico all year round as well to Terceira and Graciosa in the peak season.  Where to stay: Quinta do Canavial. ️ 3 activities to try: Apart from ingesting cheese in biblic amounts, surfing, mountain biking, hiking.  Go here if…: you want some of most dramatic landscapes in Europe. 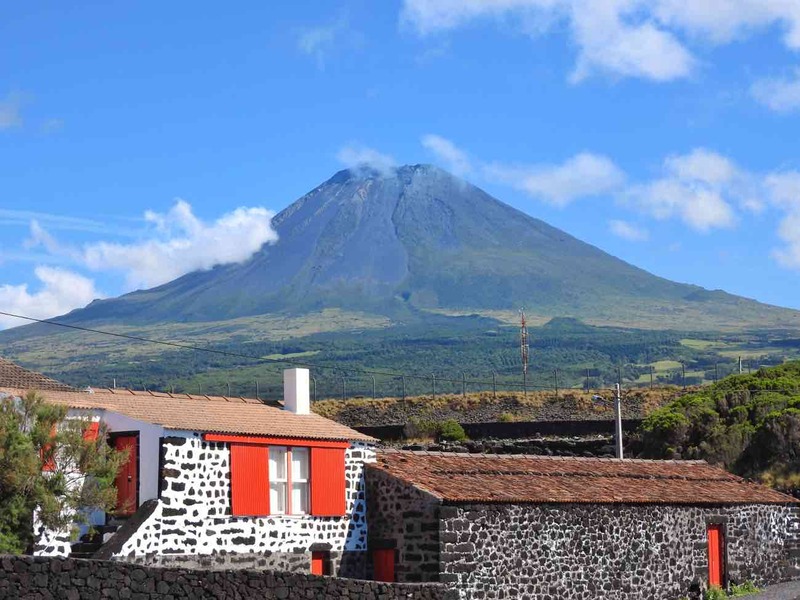 The landscape of Pico is undeniably dominated by Mount Pico, the highest peak in Portuguese territory. In fact is this unique combination of perfectly in-sync mountain and sea sceneries that makes Pico so special. This island is home to unique vineyards that literally grow in lava rocks and stretch out all the way to the ocean, as well as century-old volcanic caves and tidal pools to refresh body and mind. Last but definitely not least, Pico is a top whale-watching destination worldwide, an activity that (fortunately) has replaced the old whaling tradition in the 20th century. If you’re to do it anywhere in the islands do it here. ⭐ Top Attraction: Mount Pico. With 2351m, it’s the highest mountain in Portugal. The hike to the top is deceptively tricky and takes at least 5 hours (in total). If weather cooperates, you’ll be rewarded with glorious views over the Atlantic Ocean and nearby islands. A guide is recommended and I recommend Épico. ✈️ Getting there by plane: Pico is well-connected not only to other islands, but also has direct flights from Lisbon too. ️ Getting there by boat: The Atlântico Line operation runs throughout the entire year connecting Faial, Pico and São Jorge.  Where to stay: Adegas do Pico. I stayed in this area for 4 days, stunning scenery! ️ 3 activities to try: Whale-watching, hiking, wine tasting.  Go here if…: you are up for a mountain climb challenge. Faial gained a bit of land after its last volcanic eruption. Some people say the best of Faial is the view of Pico (THE SHADE IS REAL ). While you don’t want to spend more than 3 full days in the island, there are some quite interesting and diverse sights for at least 1/2 days. From the moon-ish volcanic landscapes in the Capelinhos area to the natural sea pools or even the impressive crater of Lagoa da Caldeira, Faial has some quite cool photo moments. Plus, there’s the maritime connection. All the islands in Azores obviously have a strong connection with the ocean, but Faial takes it to a whole new level. Horta has been a pivotal hub for yachts and sailboats in transatlantic journeys between Africa, America, and Europe. Pay a visit to the marina’s breakwater where the insignias of hundreds of sailors are displayed in all formats and shapes. Sort of a sailor’s guestbook. ⭐ Top Attraction: Capelinhos. The last eruption in 1957 made Faial gain a land extension of about 3 square kilometers. ✈️ Getting there by plane: Faial has direct flights from some islands like São Jorge, São Miguel and Terceira and from Lisbon too. ️ Getting there by boat: The Atlântico Line operation runs throughout the entire year connecting Faial, Pico and São Jorge. On summer there are also connections to Flores.  Where to stay: Casas da Fajã. ️ 3 activities to try: Sailing, whale-watching, mountain biking.  Go here if…: you’re looking for the most recent trace of a volcanic eruption. My home island! (promise I won’t be biased). The largest island of the archipelago has a LOT to do outdoors as well as a lot of different things to taste. São Miguel is a trip by itself and a gateway to the Azores as it contains a little bit of everything the entire archipelago has to offer. 4 days is the bare minimum to scratch the surface of São Miguel, but there’s enough to keep you busy here for at least a week. 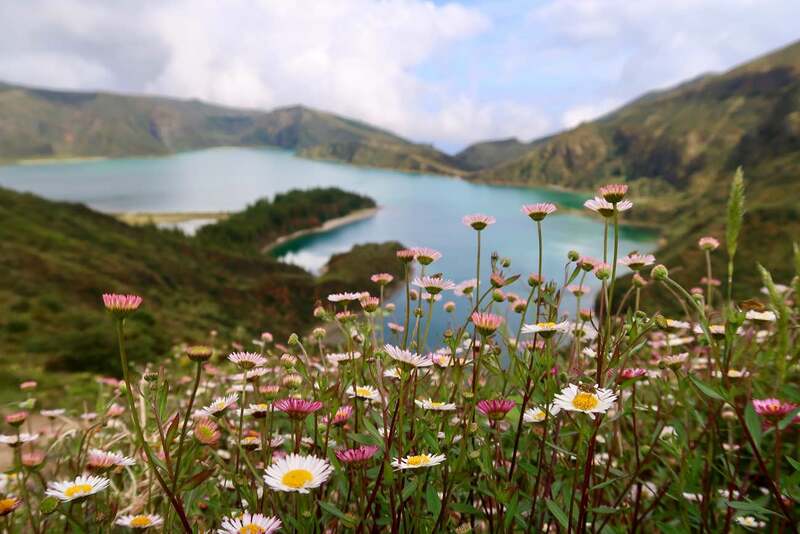 Beyond the maritime city of Ponta Delgada, there are majestic lakes reminiscent of ancient volcano craters, dark volcanic sandy beaches and outdoor hot springs to relax in. Pasture and herds of happy cows chilling on the lush hills are the most common scenery though – after all this is the “green island” for a reason. The island is also a paradise for hikers, with dozens of official trails making their way across all kinds of landscapes in various shapes, sizes, and difficulty levels. ⭐ Top Attraction: Sete Cidades. The twin lakes of Sete Cidades can’t always be seen on all its glory amongst the foggy weather up in the mountains, but if you’re lucky, it’s a breathtaking moment. ✈️ Getting there by plane: You can get to São Miguel from almost all the other islands, as well as from Madeira, Lisbon and Porto. International direct connections are gradually more common, with flights rom US, UK, Germany and Nordic countries. 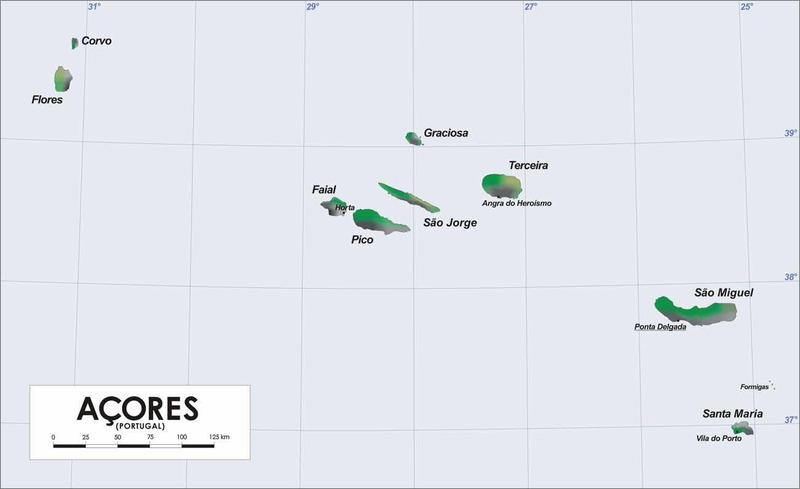 Besides Azores Airlines, companies flying direct to São Miguel include TAP, Delta, Ryanair and Primera Air. ️ Getting there by boat: During the peak season, there are ferries to São Miguel from Santa Maria and Terceira.  Where to stay: Out of the Blue. Hotel Azor for a more premium experience. ️ 3 activities to try: Hiking, surfing, paradliging.  Go here if…: you don’t want to miss on some of the major highlights of Azores. Just checking – it this helping or is FOMO settling in? While the rest of the islands are stuck in an endless unpredictable and ever-changing weather – locals call it the “4 seasons in a single day” weather -, Santa Maria laughs out loud from its warmest and sunniest southeastern spot. Santa Maria emerged from the Atlantic 10 million years ago, way before than any other island in the Azores, so it’s geologically quite different. The highlights are the golden beaches and tidal pools allow great swimming spots, above water; and world-famous diving spots like Gruta Azul, underwater. The island comes alive in August, during the music festival Maré de Agosto, but in the rest of the year remains faithful to its “chill getaway” vibe. ⭐ Top Attraction: Praia Formosa. One of the best beaches in Azores, located in a picturesque bay with crystal clear waters. Might very well be the best spot in the islands to relax and work on your tan! ✈️ Getting there by plane: Direct flights to Santa Maria are available exclusively from São Miguel. ️ Getting there by boat: There is a ferry connecting São Miguel and Santa Maria during summer.  Where to stay: Casa da Boa Vista. ️ 3 activities to try: Swimming, paragliding, diving.  Go here if…: you want to add a bit of quality beach and swimming time to your trip. Here are some ready-to-go sample itineraries you can use as a template for your trip. Some might say you can cover a lot more, but I truly believe a place like Azores is not to be rushed. Embrace the opportunity to fully appreciate nature. Don’t spend your day on planes, cars and roads, you have enough stress on your daily life already. The example itineraries blow are tailored for first-time visitors and are designed to give the best overview possible of Azores in each amount of time. My advice here is stick to São Miguel. Don’t worry, there’s a lot to keep you busy – use my 4-day itinerary of São Miguel as a guide for your trip. There’s no point in trying to squeeze in another island – basically, you’ll pay more to rush your experience in both islands. With a week to spend in Azores, there are 2 options. You can either splurge your time in São Miguel only and have extra time to do some hiking trails, diving or whatever activities you’re interested in. If you are keen on including more stops on your journey, be strategic: a week is not a lot of time. 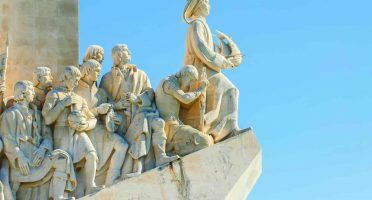 Adding Terceira or Pico is extremely convenient as you can book an open-jaw flight to mainland Portugal (saving time and money of a flight back to São Miguel). For the latter option though, if you plan to climb Mount Pico, this might be too tight and rushed. You’ll want to make sure you have enough buffer time in Pico to 1) choose the day with the best weather to make the climb 2) RECOVER from the demanding climb. This is where you can start to get ambitious guys. 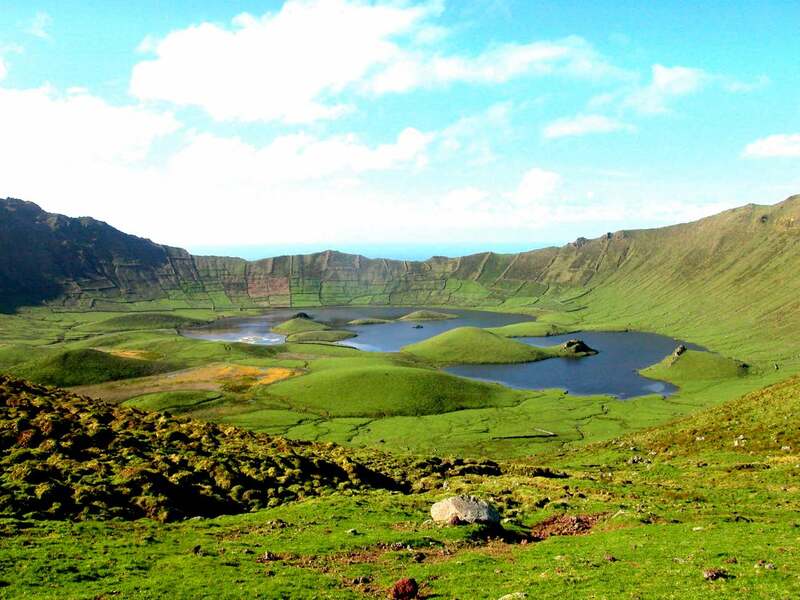 With 10 days in the Azores, invest a big chunk of the time in São Miguel and Pico. There’s experiences not to miss in Pico, as well as many outdoor activities to try in São Miguel. As for the remaining 1/2 days, stick to an island close to Pico. Faial is the obvious choice as there are frequent ferries between Horta (Faial) and Madalena (Pico). This means a doable itinerary would be Lisbon ► São Miguel ► Faial ► Pico ► Lisbon. 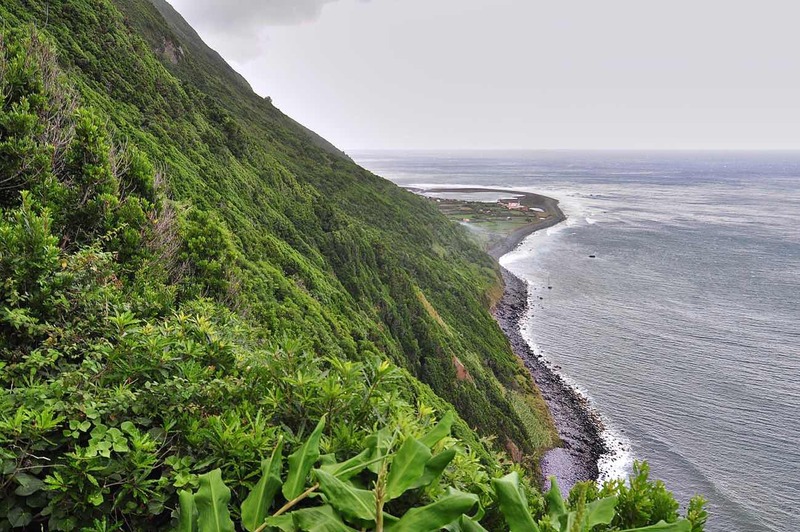 You can shuffle the order of the 3, as long as São Miguel is either in the beginning or at the end of the trip to take advantage of the ferry connection in the Triangle islands. PS: I’ve seen some people prefer to visit only two islands in this timeframe: São Miguel and Flores. There are two downsides with this option though. The first is that Flores is much more remote and may need an additional return flight to Lisbon, complicating the logistics. The other is that these 2 islands, despite breathtaking, are quite similar in terms of landscape. 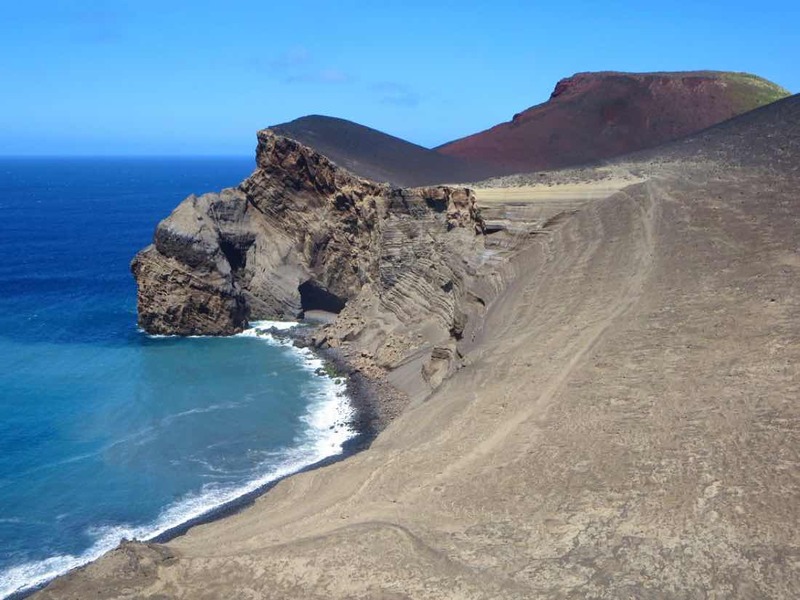 Faial and Pico add more contrast to your experience and gives you a more well-rounded overview of the islands. 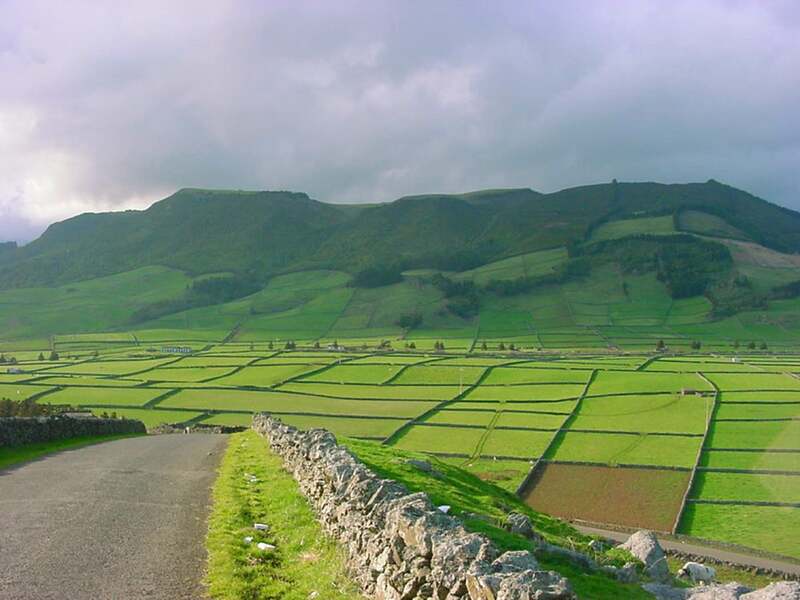 2 weeks is the perfect time to visit São Miguel as well as the three triangle islands – Faial, Pico and São Jorge. SATA Air Açores has frequent flights from São Miguel to any of these islands and once you’re there, it’s fairly easy and cheap to travel between them by ferry. Efficiency FTW. This itinerary also combines some of the best features of Azores: the impressive lakes of São Miguel, the volcanic landscape of Faial, the unique mountain-and-wine combo scenery of Pico and finally the majestic cliffs and fajãs in São Jorge. It’s a lot to awe on a single trip! So if you’re coming and returning from Lisbon, it’s perfectly doable to do a Lisbon ► São Miguel ► Faial ► São Jorge ► Pico ► Lisbon open-jaw trip. Again, shuffle as you like, just leave São Miguel for either the beginning or the end of the trip to optimize your logistics. Ok, this is where we can go crazy! Definitely use the previous 2-week itinerary of São Miguel, Faial, São Jorge and Pico and maybe even add a day or two in the first and the latter islands. As for the rest of the days, it’s time to (finally) add Flores. 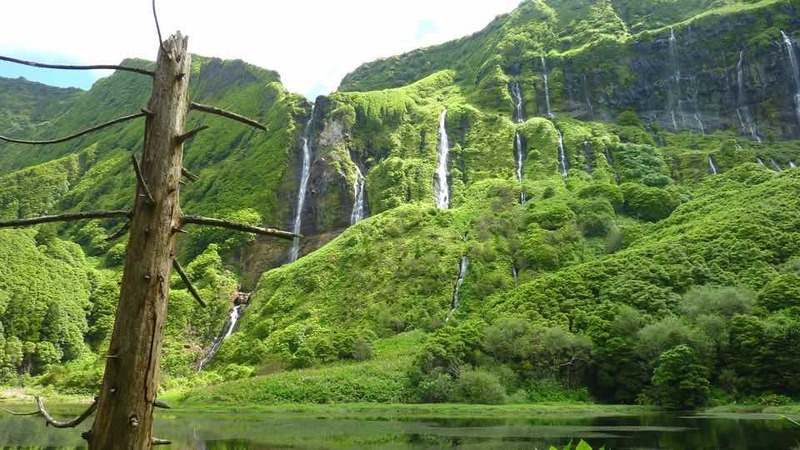 This island is a smaller, greener and more remote version of São Miguel and has got some of the most incredible waterfalls and lakes in the Azores. For the couple of days that are still left, including Terceira will give your trip a different side of Azorean food and if you got your time right, a bit of partying around too. The island is known as the party island of the archipelago! Alternatively, you can replace Flores with Santa Maria for more chances of sunny weather and some beach bum time. It will also reduce travel time and overall costs a bit as you can hop on a ferry from São Miguel. Here’s a quick summary of some example itineraries in Azores based off the number of days you have. Which islands in the Azores did you visit? How many days did you had?